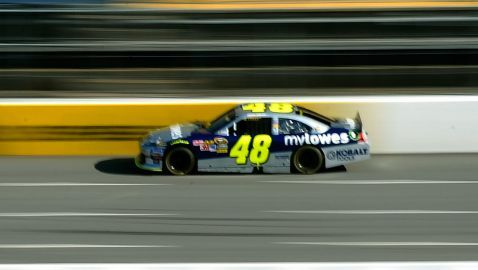 For Jimmie Johnson, Sunday’s Tums Fast Relief 500 represents a huge opportunity – the opportunity to return to the lead of the Chase for the NASCAR Sprint Cup™ and take a major step toward a sixth series championship. With the postseason winding down – just four races remain – the pressure is on Johnson to use his clear Martinsville Speedway advantage to overhaul points leader Brad Keselowski while distancing himself from pursuers Denny Hamlin and Clint Bowyer. The championship needle failed to move at Kansas Speedway, where Keselowski, with an eighth-place finish, entered and exited with a seven-point advantage over Johnson, who finished ninth. Both drivers overcame significant handicaps: Keselowski’s 25th-place qualifying run and a mid-race accident from which Johnson rebounded solidly to effectively preserve his season. Martinsville represents one of those can’t-wait-to-come-back moments for Johnson, a six-time winner – one victory shy of Hendrick Motorsports teammate Jeff Gordon, who leads active drivers. Johnson fashioned five victories in six starts between the fall of 2006 and spring of 2009. Four of his six victories have come during the Chase, two in his 2007-08 championship years. In 21 Martinsville appearances, Johnson ranks first in average finish (5.8) and second only to Gordon in top fives (14) and top 10s (18). His Driver Rating (121.4) is tops, along with Average Green Flag Speed (91.456 mph), Laps in the top 15 (6,854, 91.0%) and Quality Passes (542). Contrast that with Keselowski’s log – two-plus seasons’ worth – of 14th-best Driver Rating (82.3), 13th-best Average Running Position (15.2) and an average finish of 13.4. “If anything, we get a little frustrated through practice and then our qualifying effort usually isn’t what we want,” said Johnson, whose average start is 12.4. “But when they drop the green flag, and we are racing, we usually go [in] the right direction and I know it’s been a good track for us. Keselowski sees Martinsville as a potential roadblock to his first title. The 28-year-old former NASCAR Nationwide Series champion has competed at the 0.525-mile track just five times, posting a pair of top-10 finishes including ninth this spring. Statistics notwithstanding, there are no guarantees. Johnson and Gordon led virtually all of Martinsville’s spring race before an accident during a green-white-checker restart relegated them to 12th and 14th. Twenty-two cars finished on the lead lap, making Martinsville a miniature version of Talladega where a driver can go from the lead to oblivion in the blink of an eye.